The gang's all here and ready to jump into action! 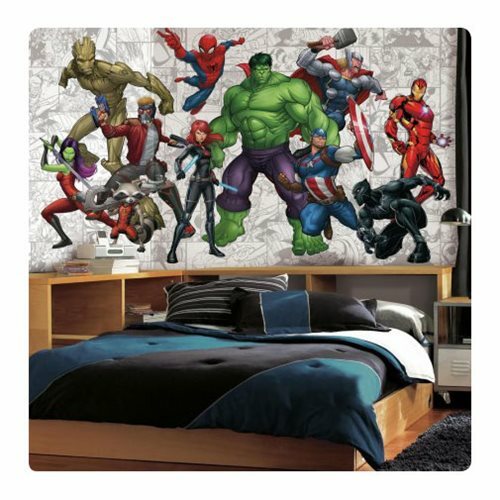 A mighty group of heroes who stand tall and strong, the Marvel Hero XL Chair Rail Prepasted Mural features The Hulk, Spider-Man, Iron Man, Thor, Captain America, the Black Panther, and the Guardians of the Galaxy team. Mega in size and powerful in design, the Marvel Hero XL Chair Rail Prepasted Mural is printed on SureStrip, a high performance and innovative substrate that activates with water. Simply spray the backing of each panel to assemble, and peel off each panel when time to remove. Measures 10 1/2-inches wide x 6-inches tall.